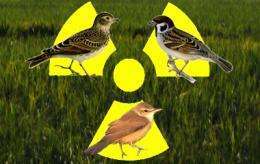 (PhysOrg.com) -- Low-level radiation in Fukushima Prefecture appears to have had immediate effects on bird populations, and to a greater degree than was expected from a related analysis of Chernobyl, an international team of scientists reported today in Environmental Pollution. According to co-author Timothy Mousseau, a biologist in the University of South Carolina's College of Arts and Sciences, this suggests that "these birds, which have never experienced radiation of this intensity before, may be especially sensitive to radioactive contaminants." The study, among the first published scientific reports concerning impacts on terrestrial animal populations in Fukushima, suggests that there are many similarities between the Chernobyl and Fukushima events and provides new insight into the first-generation effects of radiation exposure on animals in the wild. "Our results point to the need for more research to determine the underlying reasons for differences among species in sensitivity, both initially and following many generations of exposure," said Mousseau. Although these early data are critical for setting a baseline, Mousseau added that it's imperative that "large-scale studies be initiated in Fukushima immediately to make the research potentially much more revealing."